With Comic-Con kicking off next week in San Diego, one thing you might be on the lookout for when attending is some cool, new artwork. Well, if you’re in the market for something like that, one booth you should definitely check out is Mondo’s. 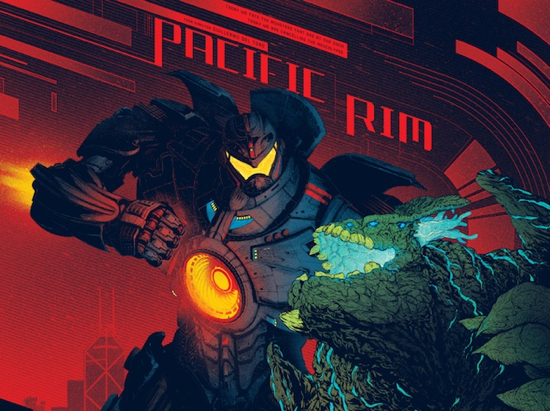 Mondo is excited to announce that it will return to San Diego Comic-Con 2013 with incredible new prints, including three colossal pieces of giant monster crushing artwork to celebrate the release Warner Bros. and Legendary Pictures’Pacific Rim from director Guillermo del Toro on July 12. The Mondo booth will be set up on the main conference floor in booth #936 throughout SDCC, Wednesday July 17 through Sunday July 21. Additionally, new prints from celebrated artists Martin Ansin, Olly Moss and Drew Struzan will be available for presale on Friday, July 12. “Mondo has always been instrumental in cementing world creation in pop culture- these posters by Ash Thorp and Kevin Tong and Vania Zouravliov capture perfectly the wild, gleeful spirit of Pacific Rim – here’s to a mad world of Mecha and Kaiju! !” said director Guillermo del Toro. We were a bit skeptical when we heard Spike Lee was directing the American version of Park Chan-Wook’s modern classic Oldboy. The first poster for that movie has arrived today and so far, we like what we see. Sure, Josh Brolin emerging from a chest in the middle of a grassy field doesn’t exactly spell things out and tell us all we need to know, but that’s a good thing. What we do like is the poster’s bizarre nature, which potentially bodes well for the movie itself. Spike Lee isn’t exactly known for this kind of movie, but perhaps this is the one that will set his career off in a new direction. For the sake of Oldboy fans everywhere, we sincerely hope so. Of course, if Lee drops the ball on this one and it turns out badly, we always have the original to enjoy. If you haven’t seen it yet, it’s definitely worth a look. Look for the first trailer from Oldboy later this week. For now, check out the full poster after the break. As Doctor Who‘s season 7.2 premiere gets closer, fans are getting a few more sneak peaks at what The Doctor and Clara will be facing. BBC America has released posters for episodes 6-9 and a new trailer. Plus, if you can’t wait for the premiere, plot details (hint: SPOILERS) are available on the BBC America site. Check out the new trailer and posters after the break. Doctor Who returns Saturday, March, 30 at 8P PT on BBC America followed by the new seriesOrphan Black. Among the many things we love around here is great design. And one of the greatest designers of all time is the legendary Saul Bass. His work on countless movie posters and title sequences, often with his wife Elaine, are among the best examples of modern design out there. Another group of people who appreciate great design are the folks over at The Fox Is Black. 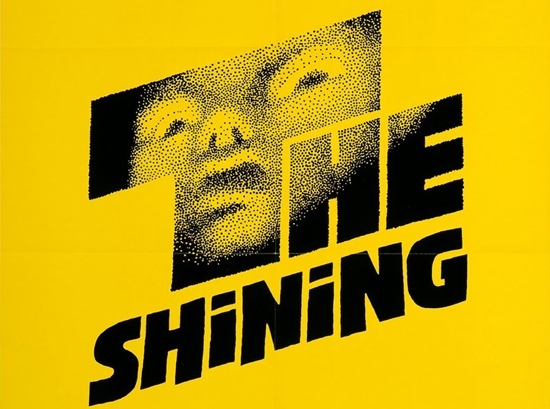 They’ve collected some great examples of Bass’ work on posters for Kubrick’s The Shining and the collection goes a long way to show the level of craft and dedication that went into the making of this iconic piece of cinema history. Check out a few other examples after the break. For much more, head over here. Doctor Who is almost back, and what better way to get you jazzed for the next batch of new episodes than with some rather impressive promotional artwork. These theatrical one-sheet inspired banners highlight each of the first five new episodes of the upcoming season. There is some pretty major stuff happening in this first set of shows which will be ushering in some change. What that change will be is common knowledge, but on the precipice of the new season we wont spoil it here, especially as these posters do a good job of alluding to what will happen without overtly telling you. One thing that is really interesting is how Steven Moffat has approached this new season. He has said in the past that he was trying to make each episode stand a little more on its own like a little movie. This was the same creative directive that Bruce Timm used in the early seasons of Batman: The Animated Series and look how well that turned out. The focus on making these episodes more like self-contained mini-movies within a larger, interconnected world might be one of the better moves Moffat has made. Every episode we have seen clips from looks stunning, and if these episodes can deliver on their promise we are all in for a little over a month of pure television awesomeness. Take a look at all the new banners after the jump. Some of you, if you’re old enough, may remember an 80’s action movie called Red Dawn, which was directed by John Milius and written by Milius and Kevin Reynolds. It featured a pretty good cast including Patrick Swayze, Charlie Sheen, C. Thomas Howell, Lea Thompson, Jennifer Grey, Harry Dean Stanton and Powers Booth. The film told the story of a band of High School students who fight against a Russian invasion of middle America and when it came out in 1984, it wasn’t exactly a blockbuster hit. Still, it did well enough and over the years it’s developed a pretty large cult following and many of us here at The Flickcast have a soft spot for it. And now there’s a reboot. This time around the cast includes Chris Hemsworth, Josh Hutcherson, Adrianne Palicki, Isabel Lucas and Jeffrey Dean Morgan. Dan Bradley is directing this time around and we’ve got the first poster for the film to share with you today. Check out the full version after the break. Look for Red Dawn to hit theaters in November. Wolverines! We’ve been following director Gareth Edwards’ career since he premiered his film Monsters during SXSW in 2010. Back then our own Chris Ullrich gave it a good review and if you ask him, he knew even then Edwards was only at the beginning of his career and destined for great things. Well, fast forward to today and during a panel at Comic-Con a surprise visit by Edwards also brought with it the first footage from his next sci-fi monster flick: Godzilla. We don’t have the footage to show you yet but until we do, you can check out the first poster for the movie right now. As it’s a teaser poster, it’s pretty simple. Still, it helps to set the mood and from what we’ve heard about the footage from the film, what a mood it is. Can’t wait to check it out. Have a look at the full poster after the break. Look for Godzilla to hit theaters next year. Most of us will be seeing The Avengers in a few days and The Dark Knight Rises trailer is still on everyone’s mind. So Sony wants to remind you all that they have a pretty big deal super-hero movie coming out too. The new posters for Amazing Spider-Man are nothing particularly exciting, although the standing Spidy one ditches that all too familiar blue-tinted cityscape for a far more intriguing and realistic color scheme. In fact I think that one now ranks as my favorite of the posters for this flick. The second of the new posters actually reminds me of those classy Dark Knight posters with Batman standing watch over a blue-tinted Gotham from inside an office building. The Spider-Man poster has what looks like a very similar blue-tinted city, but it looks more like he is busting through the glass. Might it be a subtle dig at The Dark Knight, or might I be reading way to much into a similar image? I vote the latter. You can check out these two new posters after the jump, and don’t forget to catch The Amazing Spider-Man in theaters this summer. This past weekend we saw the release of Beauty and the Beast in 3D, the most recent in a string of classic films getting a 3D face lift. The next big re-release is only a few weeks away with the first of the Star Wars 3D updates. Lucas is starting with Episode One, and is moving on through the franchise with a new re-release every year. Even though the prequel trilogy lives in infamy among most film fans, the impending arrival of a Star Wars film on the big screen still holds some weight. In advance of the February launch a new set of five posters has hit the web, each with a wildy different design and most of them actually pretty cool. It is gratifying that the posters excise the existence of Jar Jar Binks completely, although it would have been nice had Jake Lloyd received the same treatment. The upcoming 3D versions of these films represents the greatest perk of the 3D post conversion era we live in. To have an opportunity to watch classic films on the big screen again in new and exciting ways is an exciting proposition. Hopefully lesser films like the prequel trilogy don’t ruin it before we get back to the original trilogy. You can see the whole set of new posters after the jump.